As spring starts to awaken, many gardeners are searching for the perfect small tree to light up their property. The red buckeye is a good candidate. The red buckeye (Aesculus pavia) is a wonderful welcome to spring. The large bloom clusters range from six to ten inches long and the tubular flowers are a wonderful ruby shade and last for several weeks. It is also one of the first trees to leaf out in the spring, so helps banish those winter woes in more than one way. The trees stay on the small side with most specimens ranging from ten to twenty feet tall with a shapely oval crown. A few individuals have been recorded that have topped thirty feet or more, however those are rare. This is a tree that is happy as an understory specimen or as a focal point in full sun. However, the trees that are sited in shadier conditions will have a more open and branchy appearance. Native to the south eastern U.S. Its range runs from Virginia, south to Florida, and west to Texas and north to Illinois. However due to the loss of natural habitat in the wild, it is included on protected lists in some states. There are commercial sources, so harvesting from the wild isn't necessary. 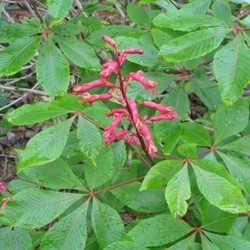 The red buckeye is hardy in USDA zones 5 through 9, so it should thrive in many regions of the country and the world. It prefers a rich soil containing lots of organic matter and acid conditions, as it would have near the forest edges and it will tolerate some drought conditions once it is established and well mulched. Few pests bother it and even deer tend to avoid it unless they are very hungry. The red blooms in the spring are magnets for butterflies and hummingbirds, so if you are wanting to plant trees and shrubs to attract them, this tree should be on your list. Just remember to site it away from walkways and patios because it does produce the large buckeye nuts that could pose a litter problem. Deer won't eat the nuts and neither will squirrels. The nuts, bark, leaves and roots of the red buckeye contain saponins which are toxic to many animals, including humans. However, they taste bad and quite a bit would need to be ingested to do any real harm. Native Americans included many parts of this tree in their herbal pharmacy. They chewed the leaves for toothache, the powdered roots for gangrene and the sap for skin sores. However, no legitimate medical treatments or medicine have been produced or discovered, so it is best to leave the folk medicine in the past for this tree. There were a couple of valid uses for the red buckeye that many peoples took advantage of. They crushed the leaves, nuts and roots and scattered them in ponds and rivers. The saponins stunned the fish and they floated to the top if the water, making them easy to capture. The roots also produce a fine black natural dye and the saponins make a nice soap good for washing cloth and skin. The red buckeye grows well from seed and it is unique in that it flowers at a very young age and small size. Sometimes flowering after one year of growth and only a couple feet tall. The header image was taken in the woods near my home and the tree is less than 3 feet tall, blooming now, in mid-April, west Kentucky zone 7a. This makes it desirable because many other trees and shrubs take several seasons to produce flowers. 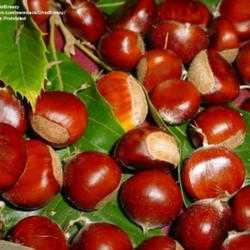 To grow a red buckeye from seed, harvest the nuts in the fall and plant them immediately. They have a high fat content and if left unplanted they rot quickly. They do need a couple months cooler conditions to properly stratify and they should germinate in the spring. The nuts can be planted in the ground or in containers, just remember to maintain even moisture in containers. This tree has a long taproot and doesn't transplant well if left to grow very large, so either plant in the place where you want it to grow, or start them in containers. It can also be propagated by rooting cuttings and this is especially advantageous if there is a tree with better blooms than average, because seed grown trees probably won't exhibit exactly the same traits as the parents, there's no guarantee unless it is propagated by cuttings. Take one year old cuttings with a couple of leaf nodes. Strip the bottom leaves and dip in rooting hormone powder. Plant in a container and cover with a plastic bag with a few holes poked in it. This keeps moisture and heat from building up but maintains moisture in the soil. Place in a spot with bright light, but not direct sun. New roots should be evident in about 6 weeks. Check soil moisture weekly and add water if it seems too dry. 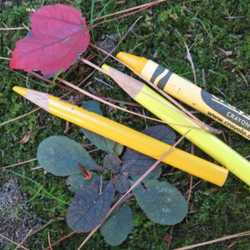 The red buckeye is an excellent choice for small, urban properties. It has wonderful early color, attracts butterflies and hummingbirds and is native to the U.S. This makes it a good choice for communities with strict HOA rules about non-native garden plants. Given that this tree is considered protected in some regions, gardeners should consider it if selecting a small tree for their landscape as it is a responsible choice. Few pests bother it and it makes an attractive addition to the landscape.